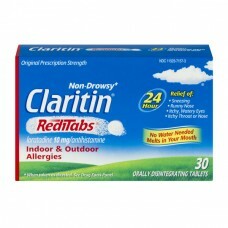 Claritin® Non-Drowsy* RediTabs® Indoor & Outdoor Allergies. Original Prescription Strength. 24 Hour Relief of: Sneezing. Runny Nose. Itchy, Watery Eyes. Itchy Throat or Nose. No Water Needed Melts in Your Mouth. Orally Disintegrating Tablets. Uses: Temporarily relieves these symptoms due to hay fever or other upper respiratory allergies. *When taken as directed. Recyclable carton. The graphics on the front panel of this carton constitute trademarks of MSD Consumer Care, Inc. All rights reserved. Questions or Comments? 1-800-CLARITIN (1-800-252-7484) or www.claritin.com. © Copyright by MSD Consumer Care, Inc. Follow these directions carefully. Do not attempt to push the tablet through the foil. 1. Peel back outer edge. 2. Gently push tablet out. 3. Place the tablet on tongue and close mouth. The tablet will disintegrate. Directions: Place 1 tablet on tongue; tablet disintegrates, with or without water. Adults and children 6 years and over: 1 tablet daily; not more than 1 tablet in 24 hours. Children under 6 years of age: Ask a doctor. Consumers with liver or kidney disease: Ask a doctor. Other information: Store between 20° to 25°C (68° to 77°F). Use tablet immediately after opening individual blister. Complies with USP Procedure 2 for Assay and Organic Impurities and Test 2 for Disintegration.